No friends? Or maybe we have too many? I need a 2-3 bedroom apartment for when my American friends and family visit me overseas. In many ways, living out of hotel rooms is getting old, but not for the reasons you think. I want extra bedrooms because I wish to bribe my American and European friends into coming to visit. And by renting a 2-3 bedroom apartment overseas, they might feel comfortable enough to visit. "Hey Mike, I have an extra room, come visit for a month. … It will cost you nothing, stay for a month if you want." And convincing friends to pay for a hotel room for a month requires an act of God, even when only 10 USD per day. One friend will come visit me abroad, then go home, tell the others it is safe, and then maybe all of them will visit. Eventually, even the friends that are not friends will come, but having to many friends is a good problem as we grow older. I have been out traveling the world continuously for over 15 years, and now I want to rent 4-5 different apartments in my favorite cities on the planet. Traveling abroad is scary for people; living abroad is even more frightening. Will the USA Government Send Me My Social Security Check? Oh yeah, and don’t forget that the American government keeps telling the citizens it is dangerous to live abroad. Personally, the idea of living in New York City is too dangerous for me, or maybe I consider it like climbing on a treadmill with all the other mice. Where there is a will, there is a way, and trust me, the ease or difficulty of getting visas in various countries is not even a consideration for me. I can live in any country I want; there is always a visa available for Americans who live abroad. Folks worrying about visas always baffle me. I choose where I live because I love the people, the place and the cost of living. The visa is last on my list of considerations. But what can I do with my friends, family, and all the friends I have accumulated over the years? I do not want to live abroad and completely desert my friends at home. But let’s face the fact: My American friends are just too afraid to visit. Somehow, I need to stack the deck, fix the game, arrange it so they just cannot say no and make them an offer they cannot refuse: a free room, which is better than a hotel. I can pick them up at the airport and give them a free room in my apartment. And, to make it simple, I could give them a visual; I could make a video of the apartment room where they would stay and put it up on YouTube.com. What good fun! I looked at a new apartment yesterday here in Kara, Togo. It is amazingly large with two bedrooms and kitchen in a completely new building, still smelling of fresh paint. Its second story balcony overlooks city, it has tons of parking, and it is completely enclosed with a huge compound wall for security. It was everything my friends, family and friends want, and, go figure, it only costs 70 USD per month (35,000 CFA). It was behind the hotel Affairs Social, somewhere after Charles de Gaulle Street. Yes, 70 USD per month! Hotels are expensive here, and apartments are cheap. And, if I understand correctly, to get the electric turned on, I go to the electric company, buy electric credit, and it automatically starts. No need to wait for the electric company to come and then sign a contract. I just buy credit, as if I was buying a long-distance phone card. And, if I had an apartment, I could hire a cleaning lady to come in every day, giving me the life of leisure, with more time to read Wikipedia, books, watch movies and do what boys do, never a shortage of love for Americans abroad. I could rent a 2-3 bedroom home easier, but then would need 2-3 cleaning ladies, plus a gardener. That’s too much work for me; I like the simple life. Bravo! Thanks for he tips. How much French do you speak? Some Third World countries are getting more expansive--especially the large cities. Any tricks for scouting out place that suitable for city dwellers and yet, not feeling living in rural and remote towns. U don't drive-- access to car with driver important to u? Sounds as if you have it all together Andy. 4/5 apartments would maybe get expensive depending where they are located, yea/nay? Also what about when you are not there for lengthy periods. Empty places get known and thieves do find them. So you wouldn't want any valuable furnishings and whatever else. What are are your favorite cities, areas? You get set up good I would be very willing to come for a month or two. Africa is one area I have not been other than flying over Egypt twice. I speak only English though. 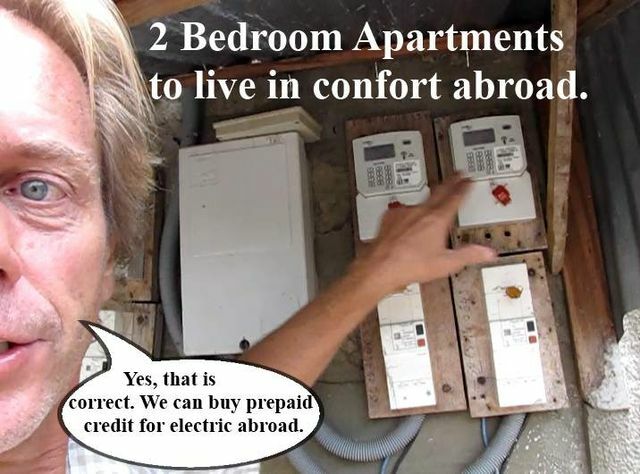 Love those prepaid meters--less work for landlord. There are a lot of places in the world that are economically reasonable and safe in general it's just a matter of doing a lot of real homework if you're planning to become an expat. You start by actually going there for a couple of months (maybe less?) and get to know the good and the bad. It may seem expensive but in the long run it will be cheaper. I was considering China, but their air quality problems are really bad and they are not going to get better real soon. Otherwise it's a very cheap country to live in and the people are friendly, it is very safe,compared to almost all other countries with a low COL. I jus cannot handle poisoned air every day. If anyone wants some ideas on doing the homework there are many sites (some are not very obvious that they are advertising) to check out and I have done this for about 5 different places so I do have some experience at it. Sorry but all at once I'm having a computer glitch and my post came up 1st that it wasn't then ZAP it's here twice. Got to see what I need to do.